There may be a middleweight out there somewhere who can withstand Gennady Golovkin, who can stand up to the combination of speed, power and skills that he brings to the table; but if there is, his identity remains a mystery. It certainly wasn’t Marco Antonio Rubio, who offered nary a punch in protest as we was swatted aside with consummate comfort and ease inside two rounds by a middleweight champion whose legend only grows with every foe he bowls over and every smile that spreads across his face in the aftermath of his increasingly dominant victories. Golovkin has long dubbed his crowd-pleasing approach to pugilism as being “Mexican Style,” which was the name of the card at the StubHub Center in Carson, California on Saturday night. That the sport’s Mexican fans have embraced him as one of their own was underlined by the crowd of 9,323 – a venue record – that roared him on. The fact that the main event only gave them four and a half minutes of action didn’t dampen their enthusiasm one bit; if anything, it only whetted their appetite to see more of the Kazakh-born California resident. 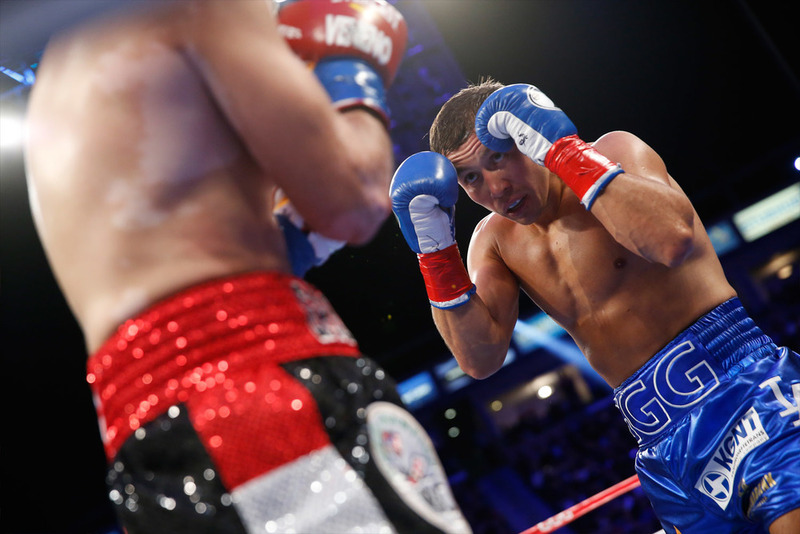 Of the fight itself, there is little to say, other than that Golovkin demonstrated again that he is more than a hard puncher, or even an extremely hard one. His deceptively deft footwork cuts off the ring and forces his opponents into the position in which he wants them to be, and his otherworldly power is married to surprising hand speed, ensuring that not only do his punches explode with devastating authority, they arrive before their victims have a chance to prepare for or even see them. That was certainly the case with the second-round blow that marked the beginning of the end for Rubio. After a first round that saw Rubio mostly moving and covering up as Golovkin tried a series of overhand rights, and which ended with a left-right combination that snapped back the Mexican’s head, Golovkin landed a big right hand that knocked Rubio into the ropes early in the second, and then dropped his hands to dig a left hook to the body before moving rapidly upstairs and rattling Rubio again. The challenger moved part way around the ring, Golovkin grazed him with a left hook and then launched a lightning fast right uppercut through the guard that caught him hard on the jaw. Seeing his opening, the champion opened up with another left hook and then a right that landed on the top of Rubio’s head. Rubio crumpled to the canvas along the ropes, and although he just about beat the count, referee Jack Reiss rightly waved it off. Rubio protested the stoppage, and even asserted afterward that former middleweight champion Kelly Pavlik, who defeated him in 2009, hit harder than Golovkin; the validity of that assertion, questionable anyway, was challenged by Rubio’s insistence that the final punch had landed on the back of his head, showing that he literally had no idea what hit him. “I liked the fight. Rubio he does not step back; he is a good fighter, I respect him,” Golovkin offered kindly, before stating unequivocally that he would like to fight Miguel Cotto or, alternatively, make Canelo Alvarez a good boy. Before that happens, a date in Monaco beckons, perhaps in February, but given his reception on Saturday night, another date in California is surely on the cards as well. “Those guys are not going to be knocking the door down to fight him,” said HBO commentator Roy Jones, referencing Golovkin’s intimidating power. “But now, fighting in LA he can draw a big crowd, so maybe those guys can get the pay-day to get into the ring with Golovkin.” Whether they would get into the ring with the expectation of victory is another matter, however. As Jones noted, “That uppercut will make you feel like you don't have a shot.” Based on the evidence to date, few people do.